My copy of StarCraft 2: Heart of the Swarm arrived on launch day. I had pre-loaded the client via Blizzard’s Battle.net service, and all I had to do to get playing was enter my license key. I started the first of the single player campaign missions at about 7:30PM and played for the next four hours. I knew I was going to be playing a lot, so I scheduled the following day (yesterday) off from work. I have completed twenty-one of the twenty-seven (?) missions so far, and I’m pretty impressed with the game. Here are some non-spoiler impressions about the single player StarCraft 2 campaign, with a recommendation on who should buy HOTS and who should pass. I purchased the original StarCraft when it came out 1998. I bought the expansion Brood War on launch day. At the time, the majority of my play was either the campaign or local network play with my friends (or Kali.net). I haven’t read any of the fiction outside of the games, but the in-game lore was a huge attraction to me. StarCraft 2 continued the story of the main characters, and introduced a few new ones. Heart of the Swarm has done a good job at profiling most of all the mainstream characters. If you’ve seen any of the trailers, you know what’s happening: Sarah Kerrigan, Terran turned Zerg turned Terran (?) is being “rehabilitated” at a Terran facility under the observation of her former love, Jim Raynor. The vast majority of the storyline is about Sarah, and that’s all I’m going to say without spoilers. I played the HOTS beta, and so I knew what some of the units were going to be. I also know from the other three StarCraft games that there are “hero” units and specialty units not found in the multiplayer. Kerrigan is the key hero unit in Heart of the Swarm. Unlike Wings of Liberty (the first part of StarCraft 2), there aren’t too many units that are unique just to the single player experience. What it does have are special variations of key units. Each main Zerg unit has at least two evolution, and you can only pick one. In addition, you can give each unit several adaptations. In WoL you had the hovercraft tank and the robo-cat. In HOTS you don’t have total gonzo units like that one, but evolutions of typical units. Another difference between WoL and HOTS is that in the first StarCraft 2 game is that WoL had some decision points within the campaign. Were you going to help X character, or Y character? Save base number 1, or planet number 2? HOTS doesn’t have any of this, and so far there has only been one discernible point in the game where my decision from Wings of Liberty made a difference. Based on the story line, I’m not even sure if it really does make a difference. The last big difference between HOTS and all of the other StarCraft single player campaigns is that the majority of the missions are from the Zerg perspective. Most other chapters of the series have you bounce back and forth between Terran, Protoss, and Zerg. Not HOTS, it really is all about the Swarm. As a big-time StarCraft player, I appreciate the macroeconomic as well as the micromanagement aspects of the game. The former is probably going to be lost on people who only play the single player campaigns. For example, Zerg units are made from larve. 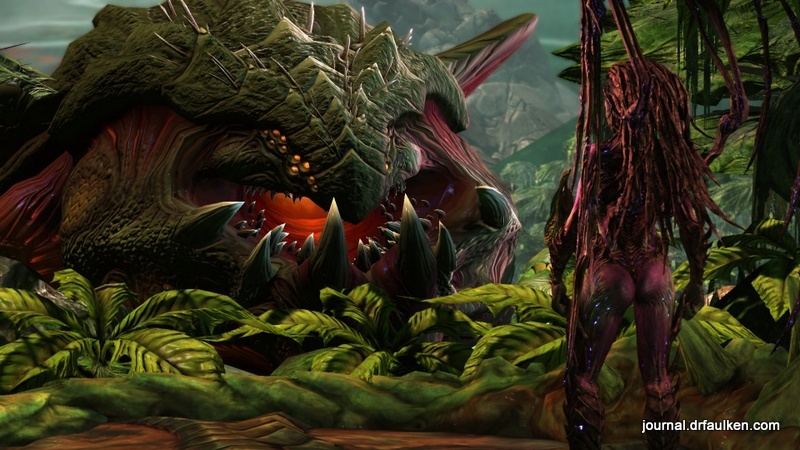 Larvae are born at the Zerg base, which is called hatchery. The trick is a hatchery makes three larvae to start, up to a maximum of five (I think). Eventually resources pile up and you’re unable to spend them on units fast enough. Multiplayer veterans know to expand (make more bases) and make additional hatcheries (called macro hatches). Macro hatches serve no other purpose but to crank out more units. This has allowed me to fly through the Normal difficulty missions with ease. I am not playing single player for a challenge; I’m playing for the story. However, it makes me wonder how hard or easy the game would be for novice players. If you don’t already own Wings of Liberty, I’d say pass on Heart of the Swarm. Even though Wings is half off right now, I don’t think it’s worth $65 or whatever just for single player. If you have Wings of Liberty and only like playing the campaign AND you aren’t playing anything else right now, I’d say get HOTS. It’s not going to be any less expensive any time soon. If you played some Wings of Liberty multiplayer but then gave up on it …. I’d probably say pass on HOTS. The new units require a lot more micromanagement and precision. The best new units are all “spellcasters” with active abilities that are taxing my already mediocre micro skills. Overall, I’m personally happy with Heart of the Swarm and the changes it’s brought. I played the first chapter of StarCraft 2 for two and a half years, and I definitely feel like I’ve gotten my money’s worth in the base game. I am sure my experience with the expansion will be just the same.